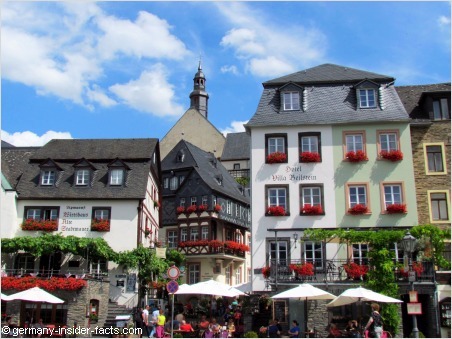 Gently rolling hills, stunning river bends, picturesque villages & towns - this is the beautiful Mosel valley. Add superb wine, good food, ancient culture, hilltop castles and friendly service, then you have a holiday region that should not to be missed. 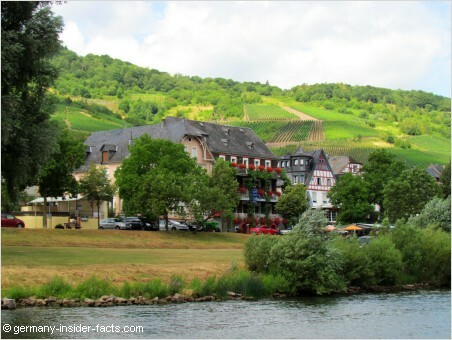 Known as Moselle in English and La Moselle in French, the river meanders through low mountain ranges in Germany. 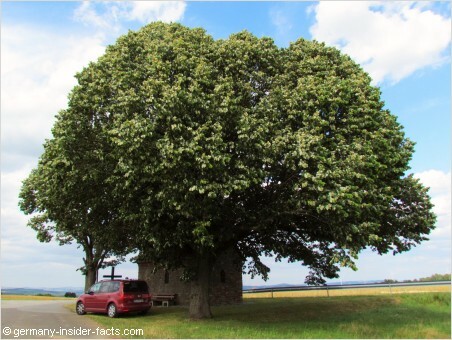 The Eifel northwest of the Mosel and the Hunsrück in the southeast invite for worthwhile excursions. Isn't this a fascinating vista? I really loved it! There are quiet and peaceful villages to refresh your senses, or lively towns to have lots of fun. Cycling, walking, canoeing is offered for the sportive visitors. 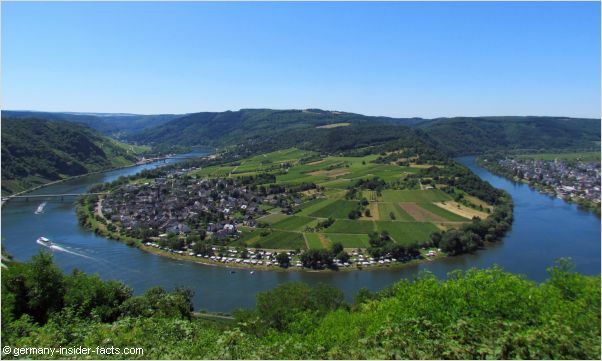 The Mosel valley has a lot in store, come and check for yourself. 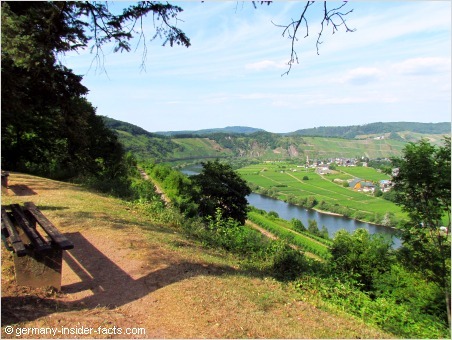 Let me introduce you to marvellous places that are nestled between the river and the terraced vineyards, where some of the best Rieslings grow. The Mosel is navigable for 394 km from Koblenz to Neuves-Maisons. It is the second most important waterway in Germany after the Rhine. 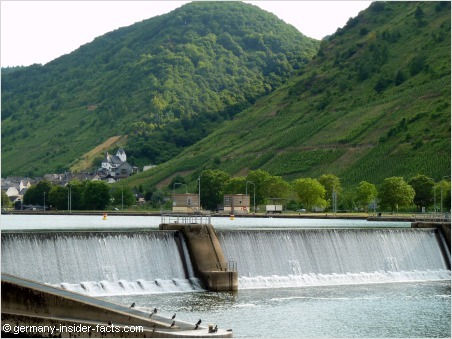 28 weirs and locks ensure that the Mosel is navigable for cargo ships up to 110 m length. The river bends are a challenge for the large ships, espcially the narrow bend near Bremm. 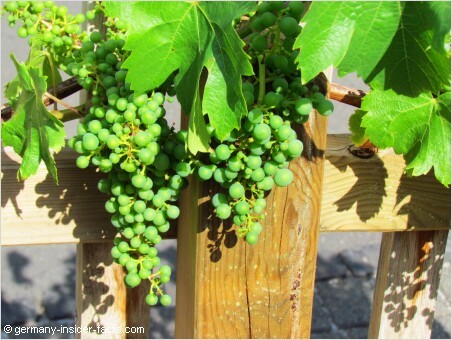 It is believed that the Romans planted the first vineyards along the Rhine and the Mosel, so producing wine has a long tradition here. Nearly 60 % of the grapes are Riesling, followed by Elbling and Müller-Thurgau. the Mosel is famous for its fine and high-quality Riesling wines. The steep vineyards are labour-intensive, mechanical harvesting is next to impossible. However, the terraced vineyards along the river maximise the exposure to the sun and the porous slate soil keeps the warmth and drains the rain. This makes good conditions for the Riesling grape. 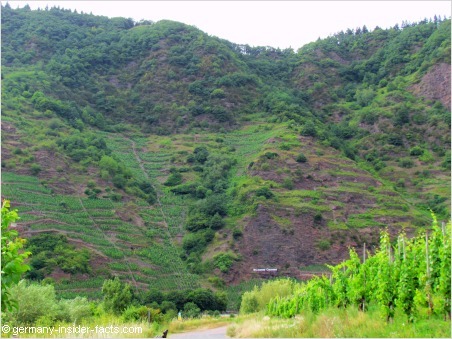 The steepest vineyard is the Calmont near Bremm with 65° incline. 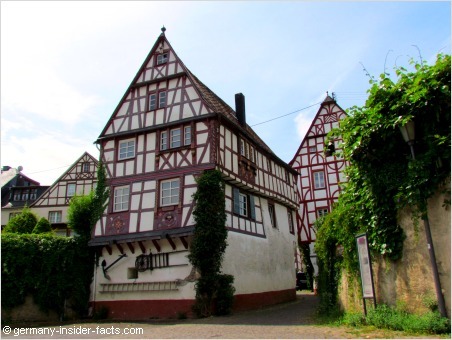 The fine examples of wines from the Middle Mosel are known to age gracefully for 50 to 100 years. The Mosel wine region is also known for producing a fine Eiswein, made from grapes that were picked after the first frost. 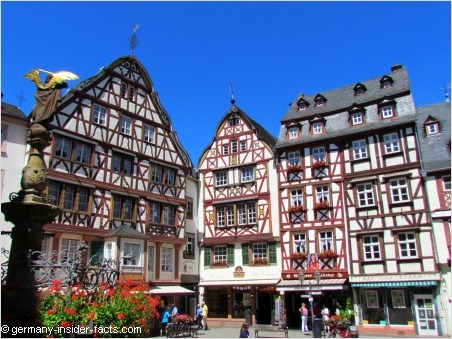 Whether you love nature, historic sites, medieval castles or picturesque towns, I am sure you will find your favourite attraction along the Mosel valley. Not only in Trier, but in many towns along the river, remains of the ancient Roman culture can be explored. The Roman poet and teacher Ausonius described the beauty of the Mosel valley in his famous poem and travelogue "Mosella". Castles and ruins dot the hills along the Mosella, and also strategic points in the Hinterland. The imperial castle was built in the early 12th century and destroyed by the French in the Nine-Years' War (17th century). About 100 years later a busines man from Berlin bought the ruined complex. The castle was rebuilt in a Gothic-revival style on still exisitng structures of the early complex. The double castle was divided into the Trierer Burg and the smaller Kölner Burg. 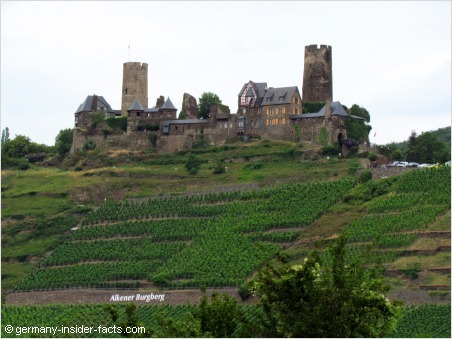 Other prominent castles include the ruins of Burg Metternich above Beilstein and Burg Landshut in Bernkastel-Kues. Don't miss Eltz castle in a beautiful valley off the Mosel. There are quite a few panorama roads and trails with lookouts that offer fantastiv views over the Mosel valley. 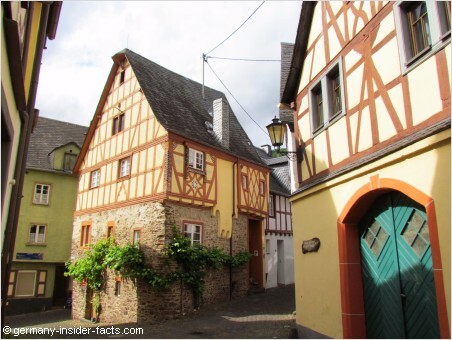 When you drive along the Mosel valley you'll pass many cute little towns. Because of the river meandering so much, the distance between Koblenz and Trier can vary a lot. Actually, it is roughly 96 km as the crow flies, but more than twice as much when you drive along each and every bend of the river. 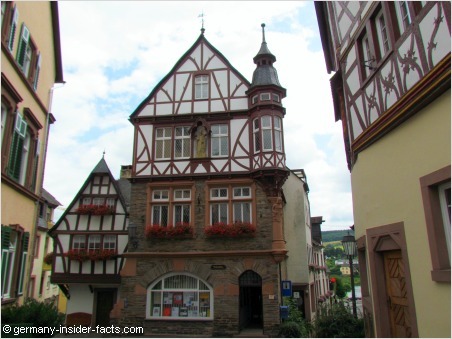 Enjoy the pictures of these beautiful villages along the Mosel Valley. Spend time on the river! 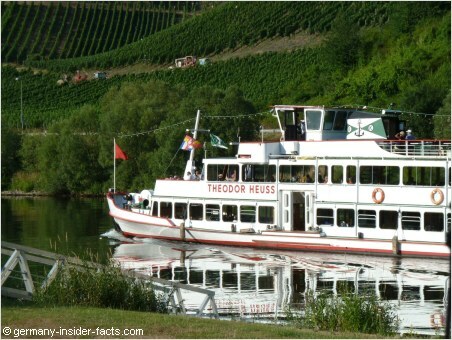 From many towns you can book a cruise on the Mosel for an hour, or even longer. Additionally, you can use the passenger boats for a one-way journey, and return home by bus or train. The ferry only needs a few minutes to cross the river, still, I think it is fun. Ferries operate usually from March to October, some carry only passenger and bicycles, others cars as well. Wine-tasting is offered everywhere, just ask at the local tourist office. 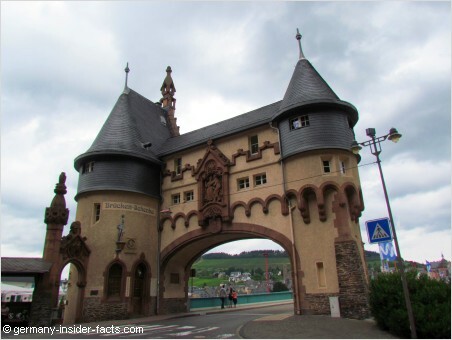 Hire a bicycle and drive along the Moselle Cycle Route. No worries, there are no hills to climb. The cycle route follows the river course, often on a separate path off the road. 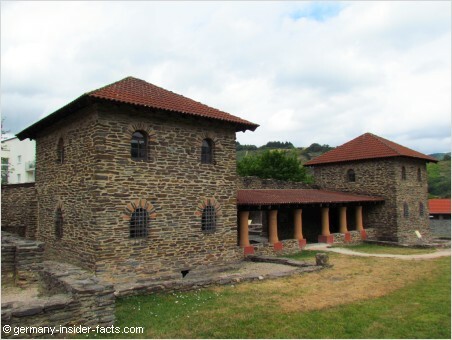 Explore the stunning medieval towns and their history. Take your time, relax. Enjoy local food and a glass of wine. 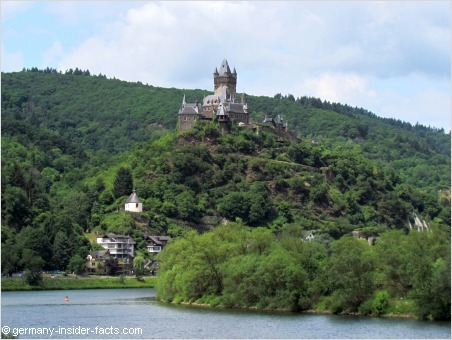 Walk up to one of the castles, or ruins, for stunning views of the Mosel valley. Please note: Many museums and castles in Germany are closed on Monday. 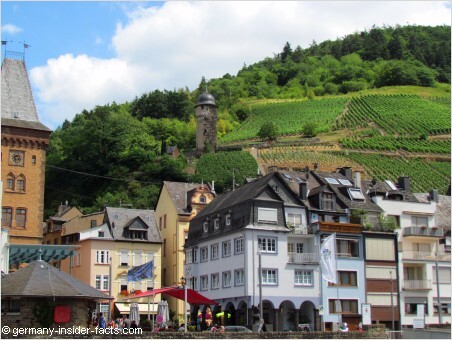 How to get to Mosel valley? 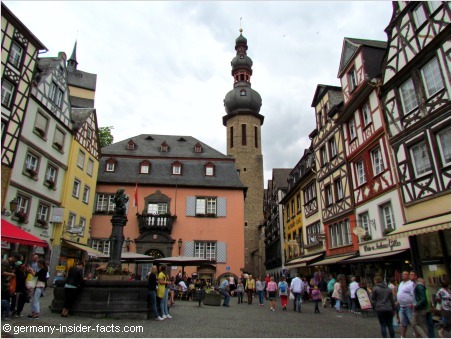 Start your journey in Trier or Koblenz, both cities are well connected with major German cities by motorways and main highways. 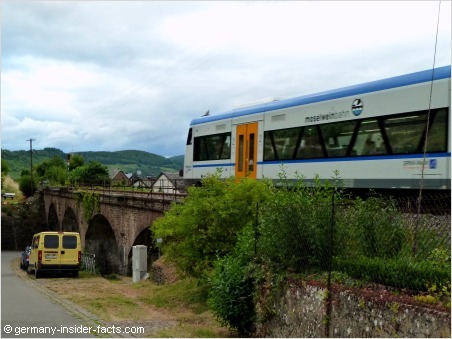 Take Bundestrassen for a leisurely drive along the river valley. Minor roads (Landstrassen) often connect the Mosel towns over the hills, so you can do some short-cuts if you don't want to drive along each and every bend of the river. The Michelin Germany Midwest Map 543 can help you with planning the route. You can check the DB website for connections. If you are short of time but dearly want to visit the Mosel, there is a day small group tour from Frankfurt. After so much sightseing you need a cosy hotel. Use the search box to find your lovely hotel in any town.